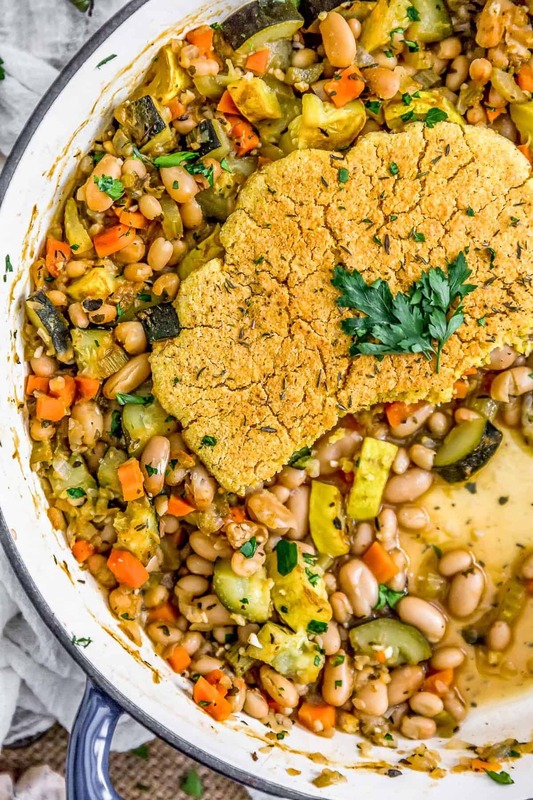 Say hello to the beautiful cabbage, you’ll be besties after this delicious dish! 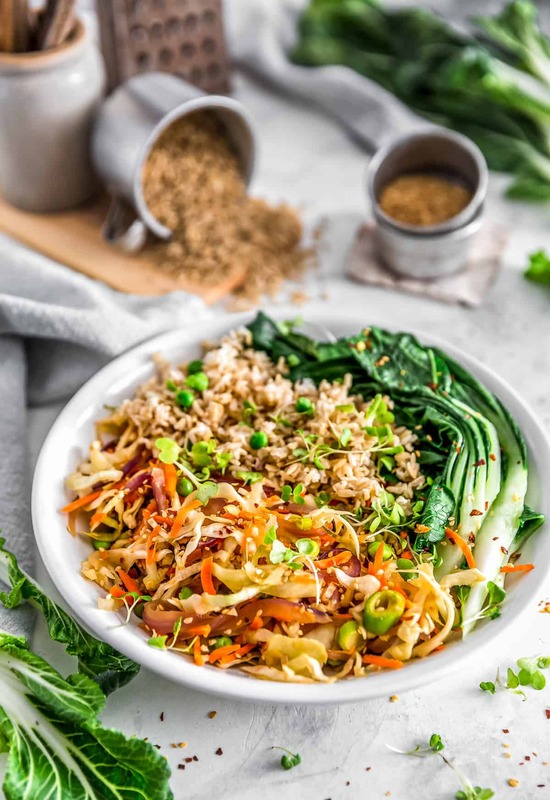 The flavors of an egg roll combined with healthy wholesome ingredients, then pilled high in a bowl with nutritious rice and sautéed bok choy, and topped with toasted sesame seeds, green onions, and sprouts, is sure to be the dish that puts a smile on your face. This Asian inspired, no oil Vegan Egg Roll Stir Fry is as easy as it is delicious. Reminiscent of the inside of an egg roll without the wrapper, this creative, nutrient dense dish is delightfully filling and super tasty making it an ultimate Whole Food Plant Based recipe! Vegan, no oil, no refined sugar, no highly processed ingredients, and gluten free. In my former life, egg rolls were at the top of my food list of most beloved foods, along with a few other dishes. The beauty of this dish is that is basically a deconstructed “egg” roll without the wrapper and of course, without the egg. As most of you know by now, I grew up in farm country. Right smack dab in the middle of major farming, with hog, dairy, cattle, and chicken farms surrounding us. The neighbors directly to the north of us (and the closest) raised hogs. When the wind hit just right, the smell was pretty intense to say the least. We were lucky enough that the wind didn’t head our way too often, but when it did, oh my, my, my, it really made you want to stay indoors and seal up the house. Farther up the road was a small dairy farmer who also had chickens. They used to sell their excess eggs to the other local farmers. During hot sunny summer days, my mom would send me and my sister to walk up the dirt road to purchase eggs from them. We were young, but back then no one had a care in the world about sending a 5 and 6-year old up the road a half mile to fetch eggs. Breakfast was typically one of the biggest meals of the day, and we went through a lot of eggs. We were fortunate and didn’t even know it, that this vast land before us was ours to play, to ride horses, run through the fields, jump in creeks, and make forts out of hay bales; we were country girls, but we wanted the city life. Our farm fields had giant electric towers that carried the power to our black and white TV’s; these towers would cross over the dirt roads of our piece of the world. On many occasions, we would walk down those rocky, dirt roads where we would have to cross underneath those mammoth electric towers, the hum that they created was eerie. It was this sound that fueled my imagination on our quest for eggs. I told my little sister that the sound was from a giant sleeping hawk that lived high up in those towers and you had to tiptoe underneath those wires so you didn’t wake it up or it would swoop down and take you. I was a little mischievous back then lol. I do miss the country life and all its beauty. As a kid, I just took it for granted that life would always be filled with gorgeous, gently rolling fields of corn, oats, and soy beans. Cows were friends that we petted, loved, and sang songs to, and if we were lucky, we occasionally got free rides across the fields from point A to point B. They are a curious lot and definitely enjoyed our songs. I apologize, I went a round-about way to tell you about egg rolls, didn’t I? I actually don’t miss eggs all that much since going Whole Food Plant Based, but, I do miss egg rolls. This dish is very tasty, and will certainly hit the spot and give you that “egg roll” fix. Try it, you’ll find yourself singing songs (to cows) too! I loooove egg rolls, and this tasty dish certainly hits the spot. 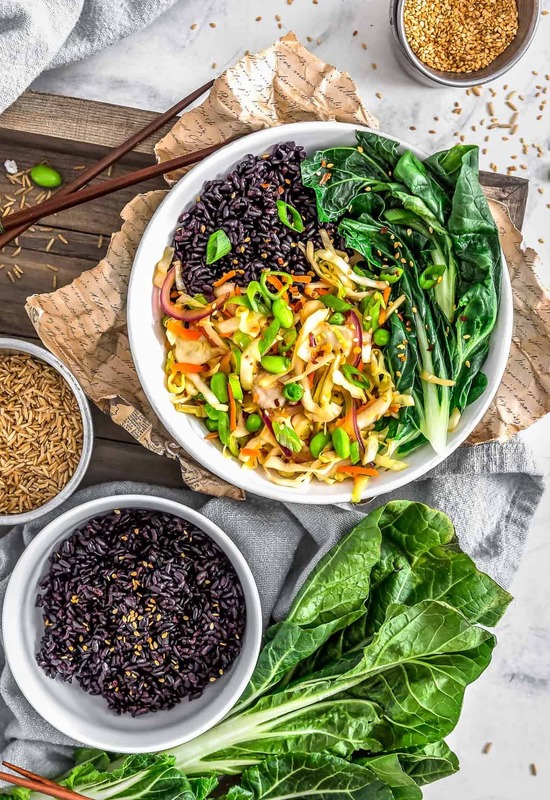 We served the Vegan Egg Roll Stir Fry in a bowl with forbidden rice (black rice) or brown rice, and sautéed bok choy and topped with some chopped green onion tops, sprouts, and toasted sesame seeds. So much yum! We hope you give it a try and love it as much as we do. 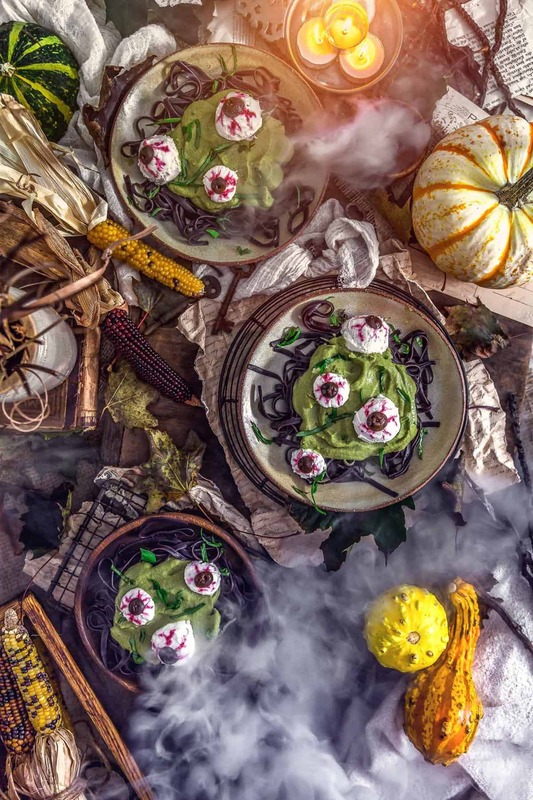 Say hello to the beautiful cabbage, you'll be besties after this delicious dish! 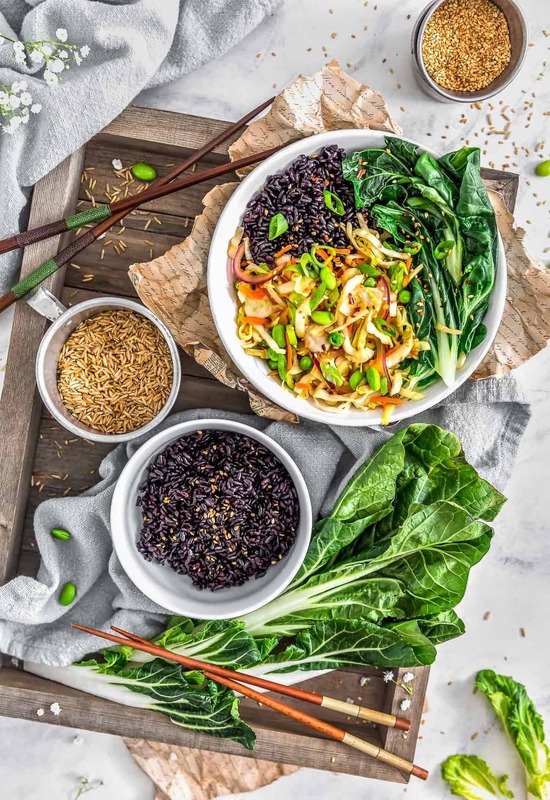 The flavors of an egg roll combined with healthy wholesome ingredients, then pilled high in a bowl with nutritious rice and sautéed bok choy, and topped with toasted sesame seeds, green onions, and sprouts, is sure to be the dish that puts a smile on your face. 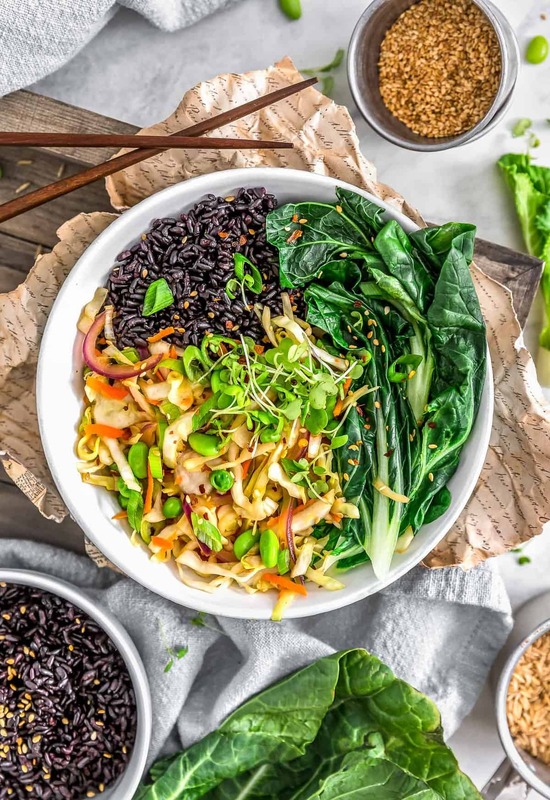 This Asian inspired, no oil Vegan Egg Roll Stir Fry is as easy as it is delicious. 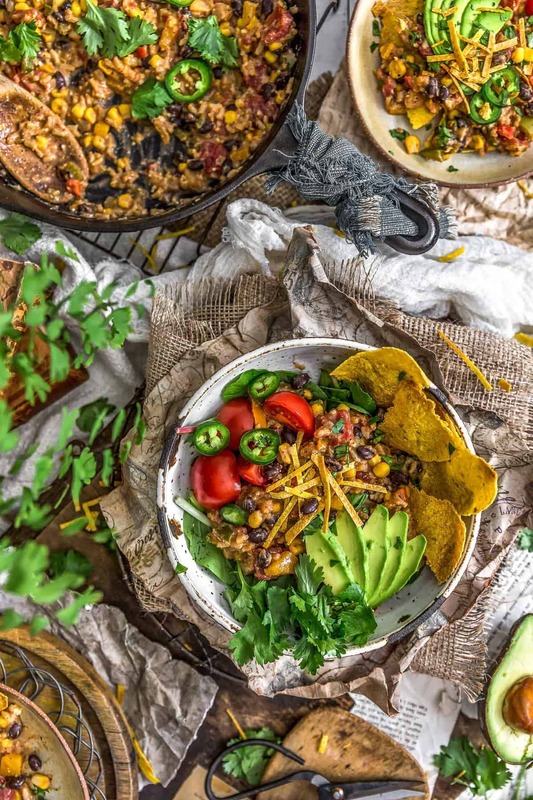 Reminiscent of the inside of an egg roll without the wrapper, this creative, nutrient dense dish is delightfully filling and super tasty making it an ultimate Whole Food Plant Based recipe! Vegan, no oil, no refined sugar, no highly processed ingredients, and gluten free. Prepare all the veggies. Set aside. Place the rice wine vinegar, maple syrup, tamari, miso, garlic, ginger, onion powder, garlic powder, crushed red pepper flake, toasted sesame seeds, and sea salt into a small bowl and mix well, set aside. In a large ceramic/enamel lined Dutch oven/pot or similarly large stockpot, add the sliced red onions. Sauté over medium-high heat for a few minutes, then add the sliced cabbage and grated carrots, sauté for a few minutes. Then add the mixture created in step 2 above and the frozen edamame and frozen peas. Stir well, cover the pot and allow to cook for 8 to 12 minutes, largely dependent on how tender you enjoy your veggies. Check often and stir. Remove from heat, keep the lid on, and allow the flavors to marry. 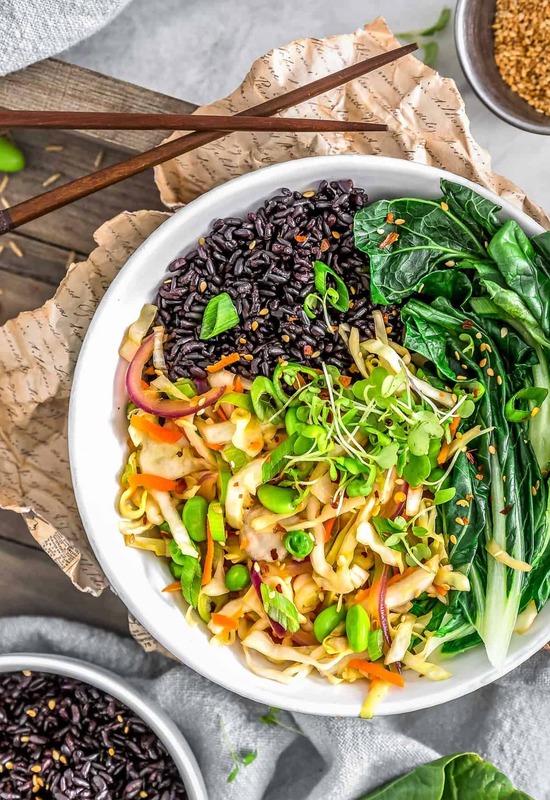 Serve with forbidden rice (black rice) or brown rice, and sautéed bok choy and topped with some chopped green onion tops, sprouts, and toasted sesame seeds. *Ginger: We used ½ teaspoon of freshly grated ginger, use more based on personal preference. *Storage: Refrigerate and use within 7 days. Storage: Refrigerate and use within 7 days.